1.Please confirm the connectors on your device before you purchase. 2.Please make sure your devices support external antennas,some devices need to set. provide you a stable and fast internet to enjoy wonderful videos, online shows and games freely. Perfect for improving your mobile broadband/Mi-Fi reception when travelling or if you are in a low signal area. 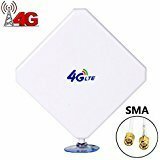 This newest 35dBi 4G LTE antenna is design to install on your 4G Mobile Hotspot Router with SMA connectors to enhance wifi signal range and bandwidth largely. Cover a long frequency Range between 791(MHz) and 2690(MHz), you can get maximum omnidirectional wireless coverage in weak internet environment. Ideal for outdoor activities. With dual mimo SMA Male connectors, it's extremely easily to install, no driver needed at all, just screw it to the connectors on your 4g router mobile hotspot and it runs. With 2 long 6ft RG174 (copper) extension cables, you can place it to anywhere and receive high quality signal from all direction. With Vacuum Suction Cup, it can be easily attach to any flat area and rotate the antenna to the best signal orientation.